Sound Propositions is an ongoing, semi-regular series of conversations with artists exploring their creative practices and individual aesthetics, conceived of as a counter-narrative to a dominant trend in music journalism which fetishizes equipment and new technologies. Rather than writing copy that can just as easily have come from a press release or a consumer electronics catalog, this series tries to take the emphasis away from the ‘what’ and shine light on the ‘how’ and ‘why.’ You can find the previous eleven interviews, as well as additional articles and features, here. Marcus Fischer (b. 1977) first came to our attention with his 12k debut Monocoastal (2010) and his subsequent collaboration with Taylor Deupree, In A Place Of Such Graceful Shapes (2011). That disc’s soothing sounds, pleasing packaging, and accompanying book of 45-sized photographs of a frozen February in the Hudson Valley earned it a guest spot on our list of Best Winter Albums. 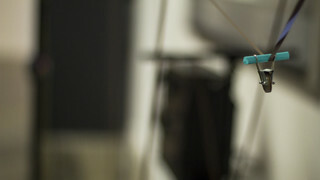 Like Deupree, Fischer also used a public blog to spur a year of daily creative projects. Beginning in 2009, Dust Breeding served to document “a thing a day…maybe more,” an impetus for creating everyday for one year. Fischer cemented his reputation, receiving additional acclaim for his 2012 follow-up Collected Dust drawn from those sessions. M. Ostermeier chose his favorite stand out tracks made throughout the project’s first year, which Fischer reworked into the final album. Duepree has already told us a bit about his experiences working with Marcus Fischer, most recently on Twine (12k, 2015) and Lowlands (IIKKI, 2017), the latter of which also accompanies a book of photographs, this time by Ester Vonplon. Like Deupree, Fischer too is working with the Minnesota THESIS PROJECT, a new label which brings together artists who might not otherwise think to collaborate. (The Thesis Project will be the subject of a feature to be published later this year.) For THESIS 15, Fischer will make a collaborative 10″ record with Matthew Cooper (Eluvium). Each Thursday in the Disquiet Junto group, a new compositional challenge is set before the group’s members, who then have just over four days to upload a track in response to the assignment. Membership in the Junto is open: just join and participate. Though rapidly approaching their 300th weekly project, Fischer’s work was the subject of the fourth installment, helping to set the tone as the series developed. Fischer provided the group with ten audio samples which made up “Nearly There,” from Collecting Dust. 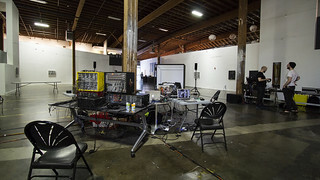 Fischer explained to the group that the song was comprised of “lapharp + ebow looped using the monome 128 w/ the wonderful MLRv application.” Noted artist Stephen Vitiello was among the participants, and even Fischer himself joined in, remixing his own work. The process did more than just generate dozens of compositions, but also inspired a spirited discussion about the nature of remixes in general. This communal character has only grown as Disquiet Junto continues to be a thriving nexus of creativity and discussion, and I encourage our readers to check them out. Dust Breeding has been quiet these last two years, however Fischer’s instagram and soundcloud continue to be full of beautiful images of his ongoing creative practice, well-arranged tableaux of sound generating gear and carefully placed instruments. It will come as no surprise that Fischer works as an art director and photographer in his other life. Not unlike his explanation of “Nearly There” to Disquiet (lapharp + ebow + monome), these snapshots serve as windows into his creative process, something we discuss in detail below. Fischer’s music has often seemed to reflect his home in the Pacific Northwest, being based for some years now in Portland, Oregon. Monocoastal foregrounded this most directly, reflecting on Fischer’s moves along the Pacific coast, another aspect covered in our discussion. Fischer’s most recent solo album is the recently released Loss (12k, 2017), billed as the long-awaited follow-up to Monocoastal. Loss feels more coherent in concept than Collected Dust, and while the intervening years have included so many collaborations and solo releases drawn from live performances (2012’s At Frame, 2015’s Public Works), the singularity of Loss registers as more fully mature work. Perhaps it is fitting that Fischer completed the album during a residency on the opposite coast, at the Robert Rauschenberg Residency in Captiva, Florida, in January of 2017. 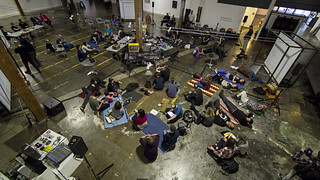 This residency fell during the inauguration of President Trump, and while Deupree felt politics should be left out of his music, Fischer tackled the current events head-on through a work of looped vocal recordings (“words of concern”) from his fellow artists and staff at the Rauschenberg Residency discussing their reservations about the incoming administration. The loss of the title reflects not just the most recent election cycle but the physical loss of sound typical of Fischer’s characteristic use of tape loops and re-recorded audio. Do you have a favorite piece of gear you’d care to talk about? Not necessary from a technical standpoint, but as a piece of equipment that you’ve developed a kind of relationship with. I tend to go in cycles of what gear interests me. I usually to lean towards compact pieces of equipment that has a lot of character. Sometimes that is an acoustic instrument like a small harp or glockenspiel other times it is something electronic like an old casio keyboard, a portable tape machine or a series of guitar pedals connected in a specific order. But one instrument that crosses over between those categories of acoustic + electronic but is not at all compact is my wurlitzer electric piano (model 140b). It is an instrument that my girlfriend (now wife) and I found at a thrift store in Olympia, Washington in the late 1990s. Prior to owning that piano I had mostly played drums + guitar in a variety of bands and made sleepy 4-track recordings on the side. At the point when we found that piano all the bands that I had been playing in had dissolved and taking a break from drums and guitar felt so right. My personal work really began to take shape after a few years of using that piano as my main sound source. Because of its weight I don’t often bring it out to perform live but when I do, I am always happy I did. One of the tensions I’m interested in exploring through Sound Propositions is the difference between working as an artist in the studio (producing records and compositions in “fixed,” recorded form) and in performances. In your liner notes for Public Works you gesture towards one way of distinguishing between the two, appropriately enough as a compilation of live recordings. The titles I have chosen for these recordings instead reflect my memories of the particular performances or the situations that surrounded them. This release serves to document the sounds that were created and not as a replacement for seeing + hearing live improvised music in person. So, how do you approach recording versus performing? My studio practice and live performances are very different… not necessarily in tone or sound palette, but in the approach. 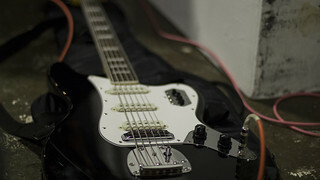 For live performances everything is improvised. Prior to the performance I typically decide on a system to improvise within. What that means to me is that I will assemble a set of instruments, effects and some kind of sound layering device to bring to the performance. Just what elements those are is always changing. 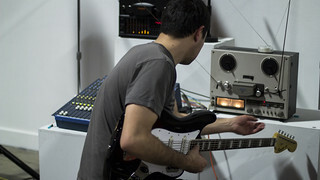 Recently a performance system that I used was guitar, octatrack (sampler) and a few guitar pedals. Other more complex systems have involved extremely long tape loops, external speakers vibrating objects and ebows on multiple objects. One constant is that other than sometimes a field-recording or two I always start without any prerecorded material. I build up layers of sound from the things around me and the audience always gets to see where those sounds are coming from and how they are being manipulated. When performing live I never get nervous or feel stressed in any way. For me it is an almost meditative practice. I listen to each layer and respond to it with subtle manipulations or additions. My live work is almost entirely additive. I am layering and layering sound and building up these complex overlapping elements. In the studio I begin much in the same way as I do for a performance but at a certain point the two diverge. That additive process gives way to an almost brutal subtractive editing process. I start with a recording of several long improvised takes on a theme and begin cutting and trimming until I feel like I can’t take anything else away. I don’t try and take out all the imperfections (for me those are often the most interesting parts) I only the elements that i feel are redundant or don’t add anything that holds my interest. What I am left with is an impression of what the original piece was but hopefully a more focused experience for the listener. Obviously related, but do you have a very different approach to a live situation in terms of improvisation as opposed to how you work in the studio? I’m especially interested in live performances that break away from the typical stage-oriented approach. I remember seeing that last fall you took part in a live six speaker surround sound showcase. How does working with changing dispersion methods (whether 6 channel or small speakers or otherwise) change how you approach a performance? SIX, the live six speaker surround sound show is something that a few other Portland artists and I have been doing for a number of years now. Tim Wescott + David Chandler own the sound system and have been instrumental in keeping it going. Each and every time I have performed at SIX I have approached it in a different way. 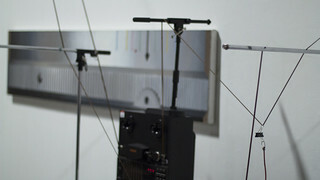 The way I view multichannel performances is that you can try and use it to create a three dimensional experience where sounds are traveling around the room or try and give the audience a feeling that there are a unique set of sounds coming from each speaker (like each represents an instrument in a sextet). I have tried both approaches and I feel like a prefer that latter with maybe a tiny bit of the former. I feel like nobody really wants to listen to 20 minutes of sounds swirling around their heads. 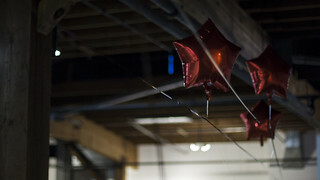 My most memorable multi channel performance at SIX was when i constructed two tape loops that were between 35 and 40 feet that went from the ground floor of the building up to the 2nd floor and were being held up by bars and helium balloons. The two loops were run to a 1/4” stereo reel to reel deck and the other went to a 1/4” 8-track reel to reel deck. All 10 tracks were being fed into a mixer where i could send whichever track to whatever combination of speakers. A lot of people were skeptical that the whole system would work but it did. Do you find that the audience relates to work differently in such settings? Does it make people more open to music they might not hear otherwise? Yes, I feel like some of the best audiences that I’ve performed for in Portland have been at SIX. I feel like people know going into it that it is a listening event and so they approach it differently. It is not unusual to see people laying on blankets with their eyes closed in deep listening. Even those who are moving around the room they typically refrain from talking. They are so quiet and respectful during the performances it is almost hard to believe. The only place where I’ve seen that level of respect during a performance was in Japan. For this track it is entirely made up of the things you see in this photo. I was simply a sound on sound tape loop that I made using a brass glockenspiel. the differences you hear in pitch were created by running the tape at different speeds. Running the tape at the fastest speed while recording but at the slowest speed during playback can drop the pitch by several octaves. This is something that I do a lot of. You can hear that technique all over “Twine”, the most recent collaborative album that I did with Taylor Deupree. I think my earliest interest in making music came from the love of two things… experimentation and sound. My personal experiences in the DIY/independent music scenes of the 1990’s really shaped who I am and my relationship to music. When I was a teenager I got into punk and indie music and started playing in bands with a few friends. I never had any formal training but instead learned by listening and improvising. For a while all the bands I played in were ones where we all traded instruments between songs so pretty quickly I became somewhat proficient at bass, guitar and drums. Always learning just by making music with others. After moving to Olympia in the mid 1990’s I primarily focused on drums. I played drums in about four different bands across quite a few genres and did solo 4 + 8 track looping/ambient music on my own. Some of those bands toured nationally and some did not but at a certain point I started turning as the projectionist for Hovercraft (an experimental/space rock band that played a live score to video collages by Ryan Shinn). With Hovercraft we got to do tours with bands like the Boredoms and the Melvins which was a fantastic experience but really burnt me out on touring in general. After I moved to Portland with my girlfriend (now my wife) we rented a small apartment where it was pretty much impossible to make any music on anything other than headphones. That happened to be around the same time I started messing around with making music with samplers followed a few years later by computers. After we moved from that apartment into a house with a decent sized basement I started playing music with Matt Jones. Those basement sessions soon became our duo Unrecognizable Now. 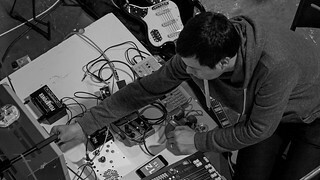 With Unrec Now we were able to combine electronics with guitars, drums + ambient textures often collaborating with other musicians and artists. Around that same time I was also working on my own solo recordings + performances. I released several digital eps + compilation tracks under the name Map~Map before abandoning that for my own name. Around 2010 I started working with 12k + Taylor Deupee … and you pretty much know the rest. Do you have any early memories of sound, as listener or recorder, that stand out to you? Nobody in my immediate family was musical so there were no instruments in our house but when I was a kid I would play around a lot with tape recorders. Mostly recording songs off the radio and dialogue from television. I loved making these weird collages of things like haunted house sounds mixed with bits of the Six Million Dollar Man or I Love Lucy. All these years later I feel like many of my music production processes are informed by my early experiments with tape. I guess we can’t escape our own history. Can you describe your working process a bit more (live or studio)? For instance, do you begin with an idea for an effects process, or a particular sound, or some particular idea? Speaking in general terms for live performances I begin with an idea and a specific set of tools I would like to use to create a piece. I use those tools to create a system in which to improvise with. Sometimes it is an assortment of small instruments and some tools for sound recording + manipulation. I always start with nothing and slowly build up and take down layers of sound. I’m sure it varies, but maybe you can walk us through another piece from a photo, one more complex than we’ve already covered, not as a template but as a kind of window into your process? 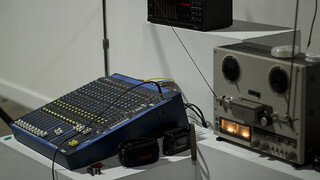 I created this piece at the Rauschenberg residency using only piano a tape loop and two tape decks. I set up the tape decks to be running off the same loop with one set to record and the other set to playback. I recorded a short improvised piece to the tape while listening back to the second tape deck echoing my performance back to me. I let it run while I in a way improvised with a time delayed version of myself. When I felt like the recording was in a good place I flipped the recording deck over to be a second playback deck and then re-recorded the piece through the built in speakers of both decks. The shuffling sounds you hear in the background is the artist Wardell Milan cutting and trimming some large prints on a cutting table in another part of the studio. How has your approach changed over the years? I’d say my approach hasn’t changed that much over the years. The main thing that is continually changing are the tools I use. I go through phases of using specific instruments and recording devices and as soon as I get really comfortable with them I tend to change it up. I like to keep myself from falling into the same old ruts. Maybe it is because all of my performances are done solo and improvised that it works to keep it interesting to me. Might I inquire as to your day job? I’m always curious about this, how these different aspects of our lives converge and diverge and influence each other. For instance, I’m a PhD student and so I teach and I write, and I’ve found that despite being very different media, my approach to writing often parallels my approach to working with sound. Somehow the processes still influence each other, for better or worse. My primary day job is in the photography industry. I mainly work as what is called a stylist. I work alongside a photographer to achieve a specific visual aesthetic. I work on a little of everything… products, composition, set design, wardrobe… pretty much everything with the exception of food (which has it’s own very specific skill set). In school I studied art and photography then later graphic design. I’ve always been very visual and enjoyed working with my hands but really don’t enjoy sitting in front of a computer for hours on end. I feel like in my work life I need to make very precise compositional decisions and always keep in mind the final product. With music I find myself seeking the opposite. I want to leave things ambiguous and a bit messy. I embrace the chance and randomness that occurs in my music and shake off anything that is too controlled. So in a way my work and my music are at odds but somehow it works out for me. Perhaps a controversial question, but I wonder if you have any feelings about the relationship between art and politics (broadly conceived). Is there a politics (or an ethos, perhaps) to your work? Considering your explicitly political work made for the inauguration, I can imagine you might have some thoughts on this. Having come of age when I did there were a lot of politics mixed in with making or consuming independent music and it felt totally natural. There was a lot of music out there with specific political messages but in reality just the act of releasing music outside of the major music creation and distribution channels or buying music from independent record shops was a kind of political act. A lot of big labels + corporations were throwing a lot of money around and there was a lot of stigma around the idea of “selling out”. I think a lot of artists thought more about the impact of doing something like licensing music to an automobile company or a fast food commercial. I think there is a lot less of that now. I feel like art is at it’s most powerful when it is mixed with politics. Great art is there to show you a perspective and to challenge something about the way you think. In the United States we are living through some seriously fucked up times politically, with an administration that has done nothing short of declaring war on human decency and seeks to eliminate all funding federal funding for Art organizations and many important social programs. I feel like if you are an artist making work during these times and you care at all about the future, you have a social responsibility to make work with a message. Yann Novak and I had an exchange about making political ambient music and it got me thinking deeply about it. I feel like the intent can be there without having to spell out your message but It is a lot harder to do when making wordless pieces. I challenged myself to create a track entirely made up of words while I was in residence at the Robert Rauschenberg Residency. The day before the inauguration I asked my fellow artists in residence and some members of the Rauschenberg staff to list their concerns regarding the incoming administration. 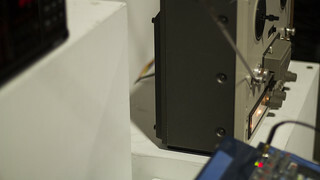 The piece took the form of a three minute tape loop that played throughout inauguration day. I would love to continue to create work like this using voices in layers. I always like to ask about an artist’s favorite work outside of sound art or music. What books, visual art, theatre, films, etc you are inspired by, or find common cause with? Are their artists working in other media (past or present) that you feel an aesthetic kinship with? I find a lot of inspiration in the work of artists who do not confine themselves to a single discipline. Rauschenberg was how he clearly loved to collaborate with different artists across disciplines. I feel like that whole Black Mountain College spirit of collaboration is really something beautiful. Cage, Cunningham, Rauschenberg and countless others making work and exchanging ideas. Where would we be without those collaborative works. Your new album was just released this month on 12k. What can you tell us about it? Yes. At long last there is a new Marcus Fischer solo release coming out on 12k. It is kind of ridiculous how long it has taken me to complete… not that I was working on it non-stop for the last five years but I would put time in working on it for a while and then abandon it again. It wasn’t as if I was doing nothing during that time. My main problem was that the concept that I wanted to address was something that I was maybe not ready to deal with emotionally and rather than set it aside and work on completing an album that was all together different, I would just walk away from it for a while and filled my music making time with other collaborations, a film score, performances or just losing hours upon hours making music that was never recorded. The album is called Loss and it started as a way for me to deal with loss and the emotions that go along with that. Which wasn’t an exciting thing to do but was very necessary. It wasn’t until I was awarded a place at the Rauschenberg Residency that I was able to really dig in and finish it. During the time I spent at the residency the work that I did there helped expand and deepen the album’s concept. I began to really think about what loss is and what it means. Not just the dictionary definition or the sympathy card version but something else. What I boiled it down to was that to me, loss is when something has changed that isn’t coming back… but if it is coming back, it is not coming back in the same way. 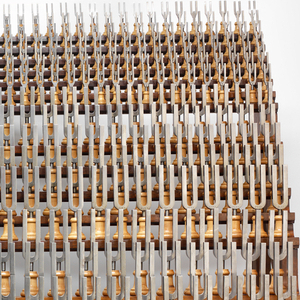 I expanded this idea into my music practice in using a lot of sound-on-sound tape loop recording and in my art practice through a series of cast brass tuning forks I created. 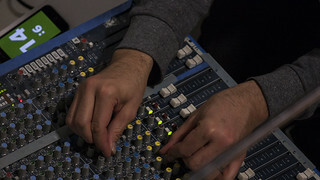 When recording sound-on-sound to analog tape, with each pass over the recording head a new sound in introduced and the previous generation starts of slowly disappear. It doesn’t always happen in a predictable manner. Sometimes things linger longer than expected. It’s within this ghosting of sound that overlapping melodies and micro-rhythms start to appear. You can hear this happening all over Loss. Though most of the seeds of the album recordings we started in Portland the album itself really a product of the Rauschenberg Residency. I was given the main studio on the property as my work space. It is just a huge white room with super high ceilings and a grand piano. In that space I was able to spread out with both my materials and my sound. The reverb in that room is enormous. While standing in the center, if you clap your hands you can hear nearly seven echo repeats before it dissolves. I really used the natural room sound a lot on the album. I even took an impulse response so I could try and recreate it using a convolution reverb (but it just doesn’t sound the same). 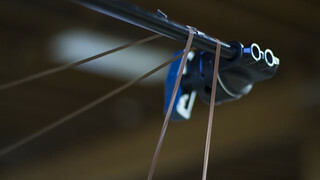 I was also able to create some really long tape loops. Loops that were many times longer than anything I could create in my own studio. The album as a whole is pretty stripped down with fewer punctuating sounds as my other releases. And while the theme might be considered dark, I wouldn’t consider the overall tone to be dark. Although while Taylor was mastering it he send me a message regarding the title track on the album saying “I must say LOSS is probably the most ridiculously bleak track ever released on 12k” which cracked me up but was also probably true. I’m excited for the album to come out and excited to move on to writing/recording more solo material. I have a few things in the works that I am really looking forward to. You and Taylor have another record together on IIKKI, Lowlands. Again, would love to hear more about this project. That project is unique to us in a few different ways. It is the first of our collaborations to no be released on 12k and despite being on opposite coasts, Lowlands is the first project that Taylor and I have done together where we were not in the same room while working on it. All but two of the tracks were done through correspondence. It is a very slow and disjointed way of working and is never my first choice of ways to collaborate. The two tracks that we did work on at the same time were recorded in Pound Ridge as we prepared for a live performance we did in New York City several years ago and were based in part on some field recordings that I made while we were in Iceland the year before that. Pretty much all of the rest of the tracks I recorded around the same time as finishing up Loss while in Florida. We started by exchanging some tracks that served as seeds for what followed. Each of us would respond to what the other sent and then we did a few rounds of edits and mixes. I wound up bouncing all of the stems to tape once I was back in Portland but only some of them wound up making their way into the final mix. Taylor and I have a international dates happening together later this year and then hopefully we can begin another collaboration… this time in person. I didn’t really get that into the whole message board thing but there was one website that was a big part of my early experiments in making music on computers. It is/was called EM411 and was a fantastic resource for all things electronic music. People could post tracks and get feedback and share links but by far the most important to me there were pages dedicated to cities. The Portland page is how I first got introduced to a lot of my current friends and collaborators in town. I met Ted Laderas (the Oo-Ray), Mike Jedlicka (of Optic Echo radio/events/label), Paul Dickow (of Strategy + my Wild Card collaborator), Brian McCauley (Gasp) and Tim Wescott (who makes music as wndfrm and provides the best live sound in town). Coming out of mostly playing in bands, it was through that site and finding out about local events that gave me the resources to start performing the music I was making on my own. I know the site is still around now… I wonder if my account is still active? If it is you could probably find some early gems on there. I have never really looked for resources on music making techniques but I have oven sought out resources for repairing equipment In my teens and 20’s, zines were an important part of how I found out about bands and new records but there was one little zine put out by this label called Simple Machines that changed my life. It was called “An Introductory Mechanics Guide to Putting out Records, Cassettes and CDs”. A good friend of mine gave me that zine when I was a sophomore in high school and it inspired me to start releasing my own music. I started with cassettes and moved on to vinyl. I would drive all over LA from the mastering guy to the plating guy to the pressing plant and really learned at a very early age what it took to make and sell music. The selling was my least favorite part and actually still is. My mom still talks about how orders would come in from all over the place and she would see me neatly packing and shipping records. She couldn’t believe that I was just taking it on by myself like that. All of the money I made from my high school jobs went to gas and going to shows and the record money just went back into making more records + tapes. Its funny you bring up OP. Actually my wife used to work with OP founder John Foster at a radio station in Olympia. Even though there were only twenty some issues [26, one for each letter of the English alphabet] of that magazine, the effects have been broad and long lasting. That all happened decades before I ever lived there but I can’t help but feel like OP and KAOS (The Evergreen State College radio station) really set the stage for putting Olympia on the map. I was fortunate to live there during a time when so much was still happening. In the mid-late 1990s I feel like the labels K and Kill Rock Stars we at their peak and you could still see bands like Unwound and Bikini Kill playing a basement show when they would be selling out huge venues in other cities. And before we go, plug some things coming up on the horizon. 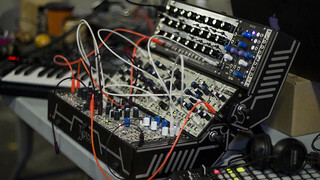 I have a bunch of cool projects in the works that I’m excited about one is a THESIS collaboration with Matthew Cooper/eluvium and another is a new modular synth based trio with Paul Dickow (strategy) and Bill Selman (warmdesk)… We are doing some shows this summer with Loscil’s new High Plains project which should be fun. Thanks for taking the time, Marcus! And thanks to our readers. You can hear more of Marcus Fischer’s work here. Please support if you can. Our next installment with Gregory Euclide should be published shortly.